There's not much at Town Board meetings that's less exciting than detailed talk about water and sewer districts. Once you get past the basic "is this a good idea?" question, which draws lots of attention, engineering drawings, infinite questions about costs and formulas, and intricacies of dealing with people who already have a connection can get endless. Sometimes, though, things can go wrong, it seems, even in our neighborhood. At least that's the view of the State Comptroller's office, prompted by citizens who apparently had questions. Today, October 7th, they'll be conducting voter registration at Dryden Town Hall, 93 East Main Street (Route 392), in the Village of Dryden from 4:00pm to 8:00pm. If folks haven't registered by the 10th, they'll be having 'last chance' registration on the 11th, including one at Town Hall from 2:00pm to 9:00pm. For more information, see their notice. It's election sign season again! 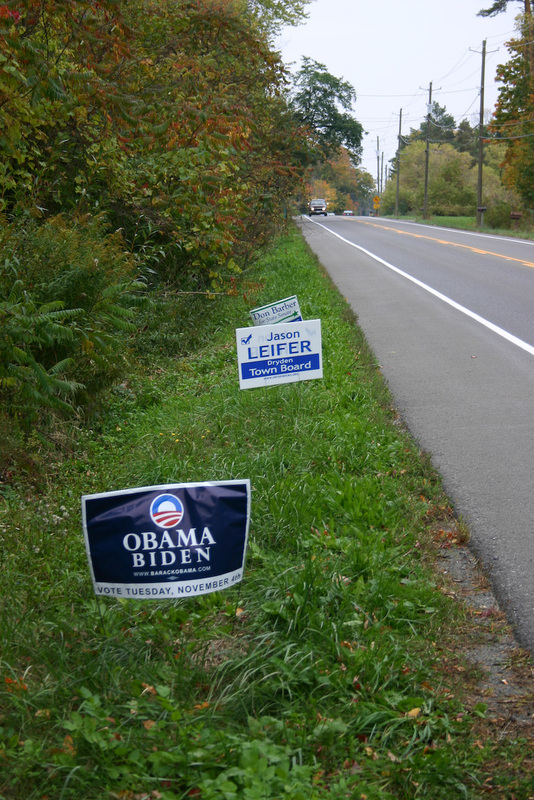 If you're a Town of Dryden resident, and you'd like (free) political signs for our Democratic candidates this year (Obama, Arcuri, Barber, Lifton, Leifer, and Valentinelli), drop me a line. If you'd like Republican signs, I suspect the best place to get them is the Republican headquarters on West Main Street in the Village of Dryden.